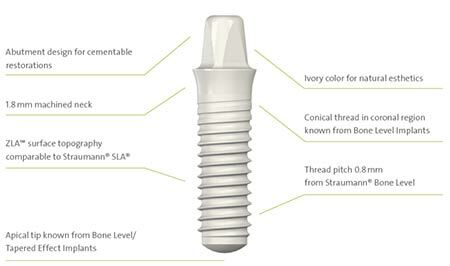 We only use a top quality dental implants from Straumann, headquartered in Basel, Switzerland. The largest and most advanced dental implant company in the world. Dental implants in NYC can be made from titanium or zirconium. We use a top quality medical grade titanium or titanium alloy, the same materials used for other bone implants and for orthopedic joint replacements. Most dental implants including mini dental implants, single tooth implants and full dental implants we are using in our Dental Implant Center in NYC are made from titanium as this metal has numerous beneficial qualities and is widely used in the medical industry. Unlike other metals, titanium is highly biocompatible with the body and is very unlikely to be rejected. Dental implant is often coated to prevent corrosion so it cannot be harmed by any bacteria, acids or salts in the mouth. Once in place, new bone cells will grow on and around the implant, and the post that is inserted into the jawbone may be specially treated to encourage this action. An implant post can be sprayed with plasma, or is etched to create a greater surface area to bond with the bone. It can also be coated with hydroxyapatite, a substance that is found in natural bone. An allergy toward titanium is incredibly rare and is difficult to accurately test for, but it is possible that a very tiny percentage of people may have an allergic reaction to titanium or to one of the metals used in titanium alloy. Our dental office only uses top quality dental implants from well-known dental companies. These have been extensively tested for strength and for safety and are made from top quality medical grade titanium or titanium alloy, the same materials used for other bone implants and for orthopedic joint replacements. By ensuring these top quality implants are correctly inserted, we can greatly minimize the potential risk of implant corrosion or failure. If you already have metal allergies or sensitivities, or are concerned about the prospect of having any metal in your mouth, then zirconia metal-free dental implants might be a possible option. These are extensively tested and are FDA approved. They have been used in Europe for many years. When Should I Choose a Zirconium Dental Implant? Zirconium dental implants are metal-free. Zirconia is an incredibly strong all-ceramic material that is already widely used for creating crowns and bridges and it is another material that has a high level of biocompatibility. Zirconium dental implants are viewed by some as offering a more holistic approach to dental health, particularly for anyone who does not wish to have any metal in their body. Some periodontists favor the use of zirconia dental implants as the design helps to discourage the buildup of plaque and tartar around the implant, and could help lower the risk of gum disease. Additionally zirconia dental implants can offer a more cosmetically pleasing result due to the natural white tooth color of this material. When you visit our Midtown NYC Dental Implants center for your initial consultation, Dr. Rahmani can discuss both options with you in greater detail and will help you decide on the best dental implants material option for your needs.